Difference between revisions of "How Has the Mexico-US Border Changed in History?" The Mexico-US border today is a contentious topic, recently leading to a government shutdown due to disagreements between the president and congress in funding of a wall that would separate the two countries. One contention has been that crime coming from Mexico has affected the United State's saftey, neccessitating a wall, although little data supports any spike in crime, particularly when compared to average US crime, due to migrants crossing from Mexico. The border itself has changed as the two countries evolved. The border reflects the history between the two countries, that has sometimes been hostile while other times reflecting strong relations. From 1810-1821, Mexico fought its own war of independence with Spain. Mexico succeeded in 1821 in establishing itself as an independent country that controlled what is mostly the Western United States and modern Mexico. The first few decades of Mexico's history were turbulent, as a struggle for power between conservatives, who wanted a centralized form of government, and liberals, who wanted a more federal system with more freedom for the states of Mexico, developed. One early goal for Mexico was to stabilize its frontier regions, particularly in what is now Texas, which was officially called Coahuila y Tejas in Spanish. Mexico invited settlers to come to the region that was underpopulated, allowing settlers from the United States to arrive. Very soon, these settlers outnumbered Mexicans, called Tejanos, and native populations living in Texas. Armed hostility between the new, mostly Protestant settlers had increased over the years, with more Mexican troops now being stations in Texas. Some of the problems included the Mexicans claiming the mostly white settlers refused to pay taxes, while the settlers had claimed the government to be corrupt. The first battle of what would become Texas' rebellion from Mexico took place at the Battle of Gonzales, although this was a relatively minor skirmish. In 1834-35, Santa Anna seized power in Mexico, who wanted to centralize control, where he suspended the Constitution of 1824. This caused a revolt in several provinces in Mexico, including now throughout Texas. Emboldened by Santa Anna's actions, a Texas independence movement led to the declaration of the Republic of Texas, an independent country, to be created in 1836. The Mexican army invaded Texas and after defeating and massacring rebels at the Alamo and other battles, Santa Anna himself was defeated at the Battle of San Jacinto, which led to his capture and being forced to sign a treaty that ended hostilities and ultimately gave Texas independence. The conflict between Mexico and the independent state of Mexico continued between 1836-1845. Part of the dispute was about the boundaries of the state, with Texans wanting areas covering what is now Western Texas and parts of surrounding states. In 1845, Texas was finally allowed to become the 28th state of the United States after a contentious process of debate in the US Congress. Newly elected James K. Polk had developed an expansionist vision for the United States, where the Manifest Destiny was widely supported in Congress, particularly the Democrats. California now also became the key prize, as that became seen as a wealthy place that would also give the United States great power by expanding to the Pacific Ocean. The United States also wanted to prevent Britain from gaining this territory. Soon, a border dispute arose between Mexico and the United States, mainly with the United States wanting the Rio Grande to be the border between the two countries. 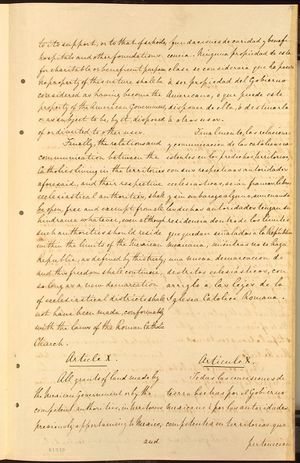 The United States sent a delegation to Mexico to negotiate the purchase of territory to California, but they were refused. President Mariano Paredes y Arrillaga then seized power in Mexico, where he did not recognize Texas' independence from Mexico. Polk ordered General Zachary Taylor (himself a future president) to move into the disputed territory with Mexico along the Rio Grande, sparking the Mexican-American War. After some defeats by the Mexicans, Santa Anna returned to power but this did little to change the fortunes of the war for Mexico. By 1848, Mexico had lost many of its key cities to the United States, although it fought some successful actions against the United States, forcing it to sign the Treaty of Guadalupe Hidalgo. This effectively created many of the western states of the United States and the border with Mexico to be defined near its present boundaries. The 1854 Gadsden Purchase, which was the purchase of land in southern Arizona and New Mexico, created what is effectively the current boundaries between Mexico and the United States. The creation of the new states and the war itself were extremely controversial in the United States, only surpassed by the larger slavery issue, where many had felt the United States acted belligerently by starting the war and forcing Mexico to cede land. What is today the southwestern United States once belonged to Mexico and the war that gave that land to the United States has been seen by many historians as having been sparked so that the territory could be taken from Mexico. While the early 20th century saw a lot of turbulence at the border, most of the late 20th century and early 21st century problems have economic causes, although at times violence in Mexico and other Latin American countries has sparked some waves of migration to the border regions.